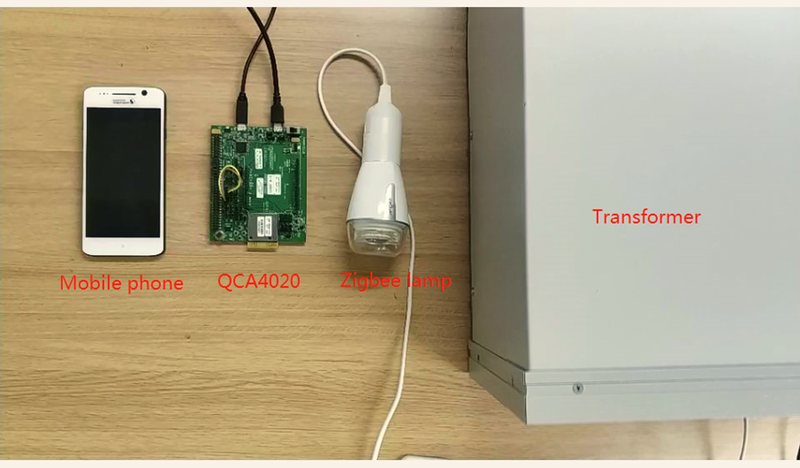 This project is designed to use the QCA4020 development kit to control the Sengled Zigbee bulb using an Android mobile phone and demonstrates Home Automation. You can control the bulb, turn it on/off, change the color temperature and dim via the app ”Home_Console”. The main objective of this demo is to create intelligent lighting using the QCA4020 development kit. This is done by using an application on the mobile phone, running Android O, to connect to the QCA4020 via Zigbee and control the Sengled bulb. Mobile Phone with Android O operating system. Transformer/power supply to turn on the Zigbee Lamp. Download code from the github repository. Compile the code and flash the image as described in “QCLI_demo with QCA4020 Development Kit” project. Install the application found in the Github repository on the Android phone. The QCA4020 development board is designed to control the on/off status, color temperature and intensity of the bulb via Zigbee protocol. The sections below will show you how the various controls and interfaces in this demo have been implemented, and how the QCA4020 development kit can control the bulb via these interfaces. Initialize Zigbee protocol and build Zigbee network. The function "Connect_ZigbeeDevice()" is to wait for connection of Zigbee bulb, "flag_connect" is used to judge whether the bulb joins into the network successfully or not. Add the following code to the file “/quartz/demo/QCLI_demo/src/qcli/pal.c”. "flag_form" is set to 1 after the network architecture is built successfully. Add the following code to the file “/quartz/demo/QCLI_demo/src/ zigbee/zigbee_demo.c”. We can set "flag_form" to 1 after the devices connect successfully. Add the following code to the file “/quartz/demo/QCLI_demo/src/zigbee/zdp_demo.c”. Add the function "Control_ZigbeeLightOnOff" to turn the bulb on/off in the file “/quartz/demo/QCLI_demo/src/qcli/pal.c”. To dim the light bulb, add the function "Control_ZigbeeLightLevel" to the file “/quartz/demo/QCLI_demo/src/qcli/pal.c”. To control the color temperature of the bulb, add the function "Control_ZigbeeColorTemperature" to the file “/quartz/demo/QCLI_demo/src/qcli/pal.c”. Here is how to save the network address of the bulb, the code is located in the file "/quartz/demo/QCLI_demo/src/zigbee/zigbee_demo.c". Finally, we need to do function encapsulation process. The code related to color temperature is located in the file "/quartz/demo/QCLI_demo/src/zigbee/clusters/zcl_colorcontrol_demo.c". The code related to level control is located in the file "/quartz/demo/QCLI_demo/src/zigbee/clusters/zcl_levelcontrol_demo.c". The code related to color on or off status is located in the file "/quartz/demo/QCLI_demo/src/zigbee/clusters/zcl_onoff_demo.c"
The code related to endpoint creation is located at "/quartz/demo/QCLI_demo/src/zigbee/zcl_demo.c". Encapsulate below functions "d_cmd_ZB_AddDevice", “d_cmd_ZB_AddDevice", "d_cmd_ZB_SetBIB", "d_cmd_ZB_Initialize". Now that you understand how controlling the light bulb is implemented in the project, below are some usage instructions to test the project. Power on the QCA4020 via the power button, and the QCA4020 will build the Zigbee network automatically. Power on the Zigbee bulb, and it will join the Zigbee network automatically.